Some background: Spain is a Catholic country and has been for centuries. While today's Spanish might not attend church every Sunday, the Catholic traditions are deeply rooted in their culture and way of life. Semana Santa celebrations are a part of those traditions. The last week of Lent, starting on Palm Sunday which was yesterday, there are daily processions throughout almost every city in Spain. The province of Andalucia (where Rota is located) has some of the most elaborate processions each day. 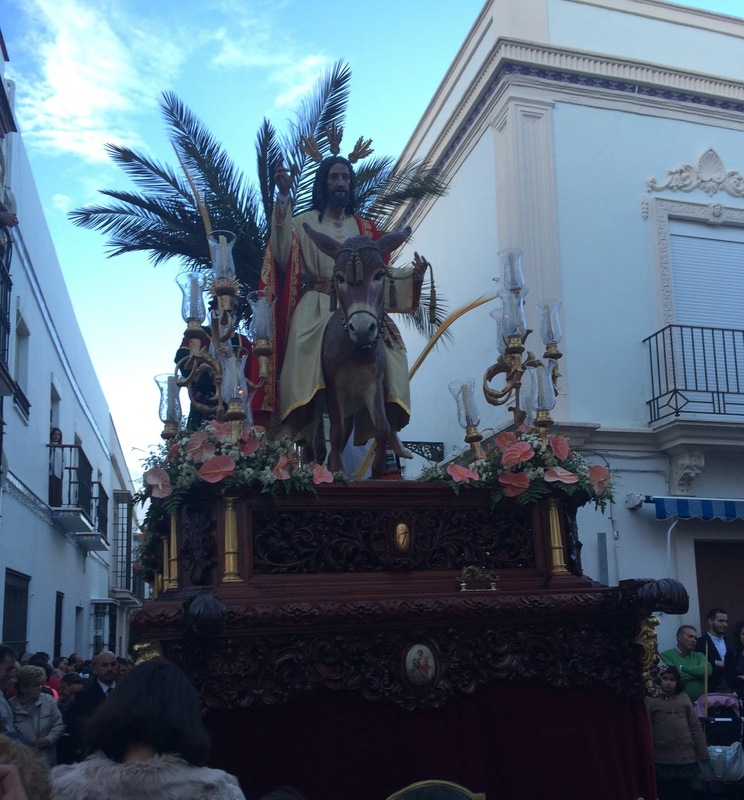 The processions consist of one float representing the certain day of Holy Week, people walking in traditional Semana Santa clothing and a band playing. Most of the people walking in the procession wear a robe and a large pointed hood that conceals the face. Many Americans will automatically associate this outfit with the KKK, however, this is not the case in Spain. Here the outfit signifies penance and is a tradition from centuries ago. And while I will say that we were warned of the outfits, it did not remind me of the KKK at all. I was so caught up in the wonder of the procession, the crowd and the feat of those carrying the float that all I could do was stand there in awe. Each year during Lent, the brotherhoods and fraternities of the various churches (all Catholic churches) create gorgeous floats that will be paraded through the city. These are not the floats you would expect to see in American parades. They are much smaller, but not any less elaborate. They have statues and relics from the church, real flowers and often candles. It is also carried by men underneath the float (you can only see their feet). It is a true sight to see. These men train throughout the year and practice in the weeks leading up to their brotherhoods' procession. It is a true honor to carry the float; there is a waiting list for those wishing to carry. The float rests on each man's head/neck weighing roughly 40-50 pounds per man. The men switch out every 20-30 minutes and most come out from the float dripping with sweat. What is is more impressive is that these men cannot see while they are walking. They are being led by a leader outside of the float directing them with knockers built onto the float and also his voice. Words cannot begin to describe how amazing it is to watch the float navigate its way through the narrow streets, under arches and even up a step. The large crowds are silent as the float nears an obstacle and then erupts in loud cheering when the task is complete. We attended the Palm Sunday procession which is the most joyous and kid friendly (and the majority of them start well past Serafina's bed time). In fact, one procession starts at two in the morning and goes until noon the next day -- yes, you read that correctly. We didn't exactly know what to expect, but somehow our expectations were exceeded and then some. The route is short compared to American parades so everyone either follows the procession once it passes or runs through side streets to catch up to the front. We were able to see the float at three different places. Typically the procession moves very slow, however last night there was the threat of rain so they were moving quite fast. The floats are made from centuries old relics and statues so if there is any chance of rain the procession will be cancelled. This was truly one of the most amazing things I have experienced in my travels. If you are ever in Spain during Holy Week, I highly recommend attending a Semana Santa procession (Sevilla has the best in the country). And now, along with the rest of Rota, we will be starring up at the sky and praying for no rain for the rest of the week! Not creeper!! Come visit anytime - our new home has a guest room and a large playroom! Amazing!! What a wonderful time to be there. Such a treat to see all the festivities of Holy Week. Thanks for sharing!!! So cool to be there during Holy Week and experience all the festivities!! !